Introducing two of our m.a.d. kid Ambassadors – and youngest helpers – Ms Maddy, 10, her sister Teegs, 9, (with their amazing mum Eva) who have worked for a month on our most recent project! 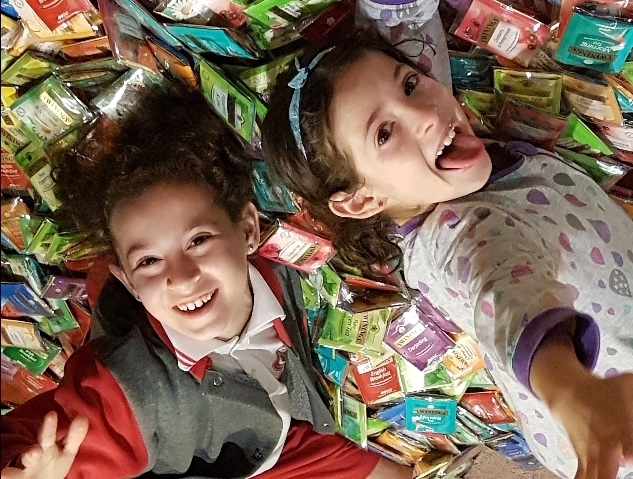 These two inspirational girls not only packed 250 gift bags with us last weekend, but they helped get tea sponsored for 2000 of our 2250 Mother’s Day care packs that went out this week for women around Australia fleeing domestic violence. In the lead up, they visited many stores with Eva and spent nights and weekends packing tea and tissue packs. The girls are now in planning for their own special project to help us help some kids facing tough times. Their kindness is inspirational! An extra special thanks to Eva who put in so many hours to help us secure, sort and pack donations. One last things to mention… tomorrow Maddy is SHAVING off all her hair to be made into a wig for a little girl with leukemia. It’s an amazing gesture from a 10 year old! What an amazing family you are and we are incredibly grateful to have you on Team m.a.d.woman!